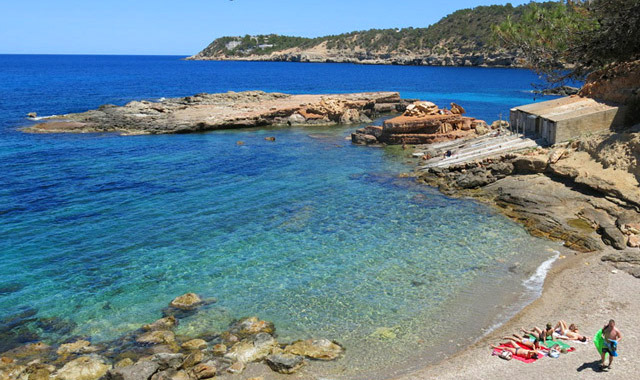 Northern Ibiza is one of the most pristine areas of the island. It is a pleasure for the senses enjoying the rich land and seascape that only the north of the island can offer. In addition, there are plenty of activities you can do in order to fully enjoy this part of Ibiza, and that is why in this post we want to give you some tips and ideas for you ideal for spending a fantastic day in some of the most beautiful and cozy places of northern Ibiza. The perfect way of starting the day off right is having a revitalizing breakfast at the Agroturismo Hotel Can Planells. Here you will enjoy the best produce from our garden and other delicious local foods elaborated in the island, such as the olive oil produced in the mill of Can Garrovers, homemade jams from Can Malacosta and typical Ibicenco cheeses and ‘sobrasadas’. This, along with our freshly squeezed fruit juices, the ‘pan payés’ (Ibicenco-style country bread) and free range eggs are the perfect combination that has made our breakfast one of our customers favourites, and which we serve in our fantastic terrace in full nature. The experience will be unbeatable. Now that we’re ready to start the day, we head to the northwest coast of the island seeking the placid waters of Cala Xuclar, a small cove with varied vegetation. Several pine trees and dense reeds flanking the beach of sand and pebbles, but with an easy access. A small beach bar dominates the beach and here you won’t have other option than unwind from all worries and enjoy the placid Mediterranean waters. A great way to fully enjoy what this little natural corner offers is by practicing snorkel, as the great biodiversity and good conservation of this part of the coast make that even a small underwater excursion is an authentic natural experience and a wonder to behold. And when the hottest time of the day approaches and the appetite starts calling, it is time to find a good coastal restaurant to savor the best seafood flavours of the island. 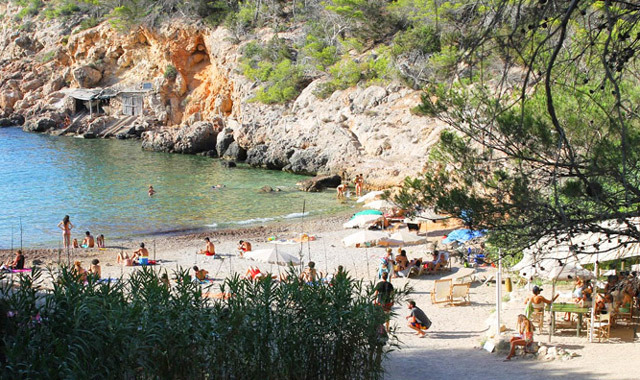 For this, we propose to go to the neighboring beach of S’illot d’es Renclí, a small beach cove with a curious small island off the coast that is easily accessible. Here you’ll find S’illot restaurant with a lovely terrace shaded by the pine trees that grow on the edge of the beach. 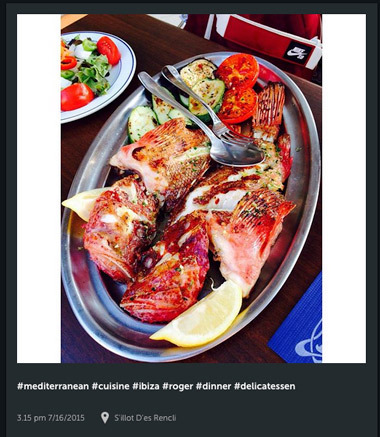 Native islanders run this restaurant and will serve tempting dishes such as typical ‘Bullit de Peix’, ‘Arroz Marinera’ and Ibizan grilled prawns among others. You will surely love all the traditional seafood flavours while enjoying the views of this extraordinarily beautiful beach. Once rested after the meal, we highly recommend taking a refreshing dip, as its turquoise waters and the original coastline you’ll find here are perfect for enjoying a lovely afternoon on the beach. When the evening arrives, it’s time to pick up your belongings and prepare for one of the most special moments of the day: the sunset. For this we will go to Benirràs, a well known beach in this part of the island because there every Sunday the hippies celebrate the famous drum party at sunset to farewell the sun, which attracts many visitors. 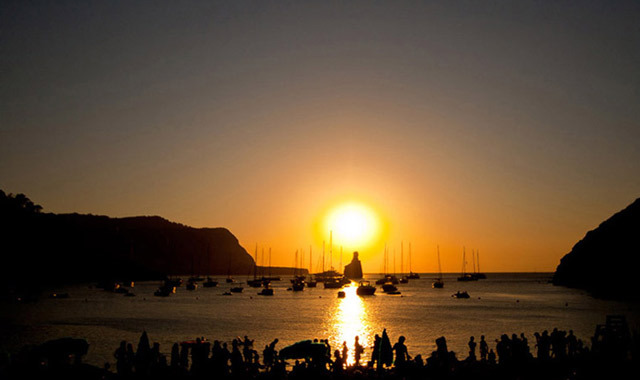 But the lively bohemian atmosphere is not the only interesting thing about this beach because here you can contemplate one of the most beautiful sunsets in Ibiza, with the warm colors of the sundown passing by behind the silhouette of des Cap Bernat, an iconic island of the Ibizan seascape. And once we have farewelled the sun as we should, the rest of the evening is reserved for a wonderful dinner in one of the most charming restaurants in the north. 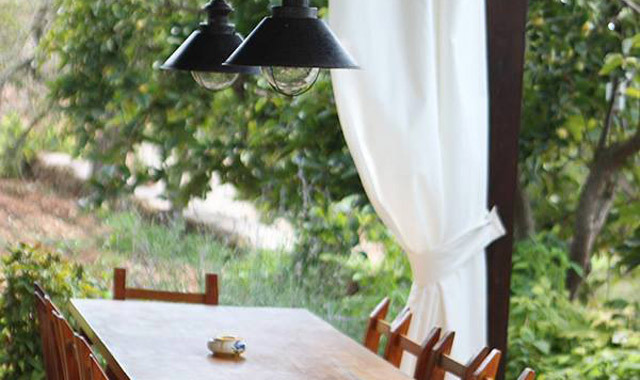 We refer to La Luna Nell’Orto, a lovely and cozy place in Sant Miquel located in a traditional Ibicenco house with more than 600 years of history. If you’re impressed by this place, wait until you try the dishes served here, all prepared with local premium quality produce and ingredients and many homemade foods, such as its bread. Simply exquisite. Grilled meats, Italian homemade pastas and signature cuisine are the protagonists of its menu. Its spectacular terrace with a very detail-oriented decor is the perfect place to enjoy such a feast. 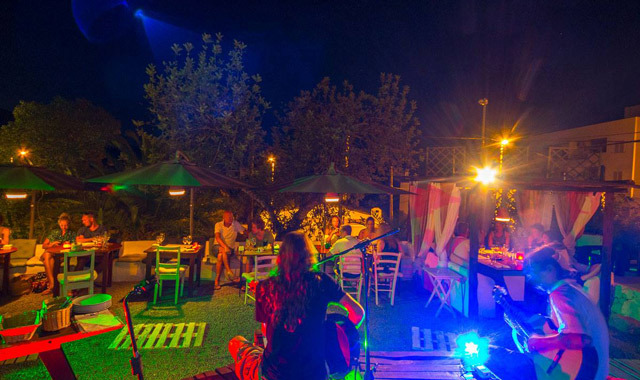 And if you’re lucky and you visit on a Thursday or a Sunday, you will enjoy their very special evenings when La Luna is enlivened with live music that will perfectly accompany your dinner.